The Berry Edge Silver Congress Horse Show Halter is doubled and stitched throughout. Fine bridle leather highlighted with bright berry edge silver trim. Finely crafted. Also adjustable in 5 locations. A (Noseband) 22.5" - 25"
C (Poll/Throat) 34" - 37.5"
A (Noseband) 25.5" - 27"
C (Poll/Throat) 40" - 45"
The leather on the halter and lead is actually pretty nice and pliable once you break it in. Silver looks fine from a distance but you can tell it's cheap up close, probably won't last long. Overall it's about what you'd expect from a $60 show halter. Very usable. 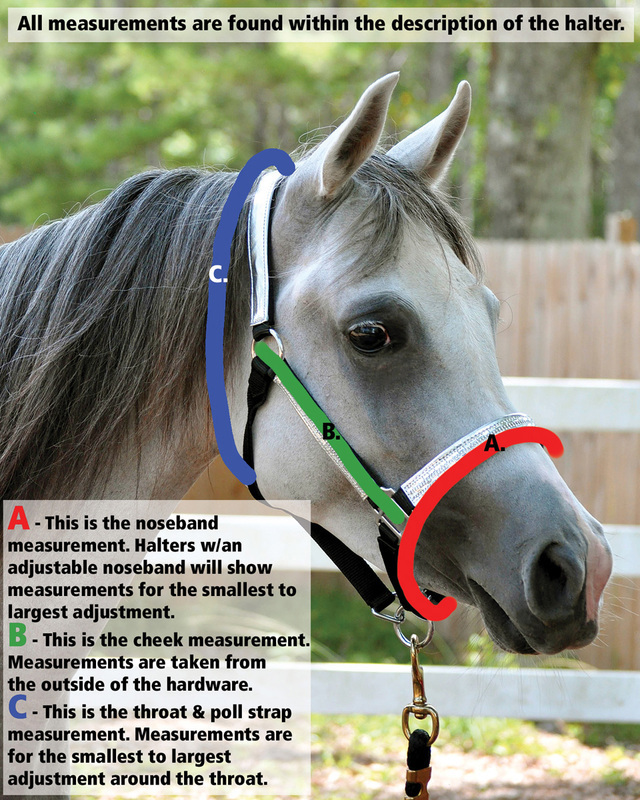 The halter is perfect for a yearling! Great bling for the money and the fit is perfectly adjustable. Would definitely recommend this halter.